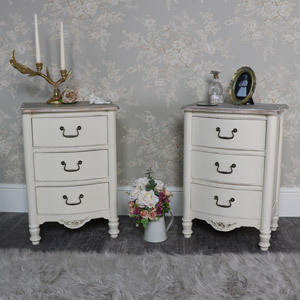 The Antoinette range is a perfect style for people who love a touch of French chic crossed with country vintage. This range is perfect to transfer your home into a beautiful chateau, an apartment in Paris or a quaint country cottage filled with vintage and shabby chic interior. With ornate intricate detailing, a limed wood top and slightly distressed finish it adds a light rustic final touch to complement its aged appearance. The classic vintage/antique cream painted finish helps to showcase the brass handles. With bedsides, drawers and console tables that will complement any room in the house from bedroom to living room and even children’s bedrooms. The range offers a perfect storage solution that looks great. Practical but beautiful. Whether you have a large space to fill or just a little corner the Antoinette range is bound to have the item you desire with its bedsides, coffee tables, console table and drawers. The Antoinette range will be the pièce de résistance in your French or country chic interior and will add a touch of elegance, class and sophistication.